One of my least favorite questions from potential clients is…”Do we HAVE to do the engagement session?” Every one of our coverage options at Rob Spring Photography Inc. INCLUDES a 60 minute engagement session. The plain and simple truth is that we want your wedding day photos to be just as amazing as YOU want them to be! And working with your photographer before the wedding is the single most important thing you can do to guarantee great photos on the actual wedding day – not to mention a great experience. And isn’t that what it’s all about anyway? Two people in love having the best day of their lives? When we first meet with potential clients we try our best to get to know them, but it isn’t always easy and we don’t always have enough time. You have questions, need answers, want to know if you keep the rights, how much a print costs, what time you need to be done with hair and makeup and how to make an album after the wedding. So often we don’t really get to know you at all outside of a short meeting at our studio. The engagement session is an excuse to work with us, feel comfortable with us and get great photos. For us, it’s exactly the same – an excuse to work with YOU, learn what makes you laugh, smile, and look great all while getting great photos! Many photographers charge additional a la carte fees for engagement sessions and the truth is that they are probably right on point charging $500 or more for the session. It’s a lot of extra work for the studio, but to us it isn’t about making that extra money from our clients, its about making that extra effort to really connect! 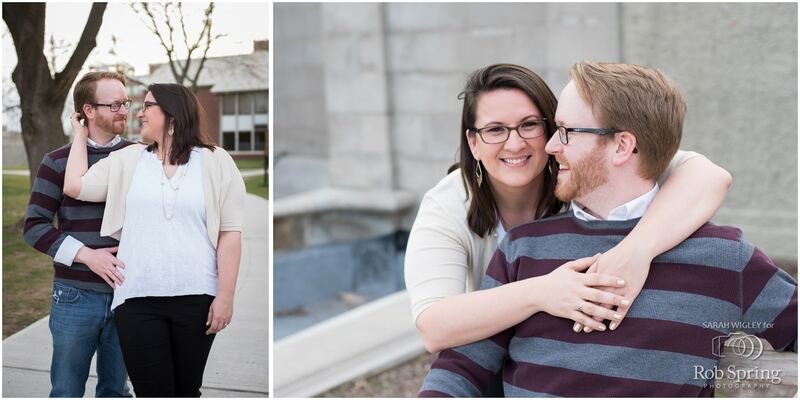 Scroll down to see samples from this past year’s engagement sessions.